With today's Green revolution and the growing need for conservation, many lawyers look to focus their careers towards the environmental arena. At Miami Law, students can take a variety of courses to prepare themselves to one day work in some aspect of environmental law either in government, the non-profit sector, corporations, or in private practice. Read more on environmental law in Miami Law news. Environmental Justice Clinic - Participate in the Environmental Justice Clinic, a civil rights project that works at the intersection poverty law, public health, and environmental protection to help redress the environmental problems – pollution, contamination – that afflict communities. Miami Law offers expert study in real estate development and real estate courses with a focus on the environment including: Environmental Regulation of Real Property, Wetland Regulation and Real Property, and The Law of Green Buildings. LL.M in Maritime Law and J.D./LL.M. 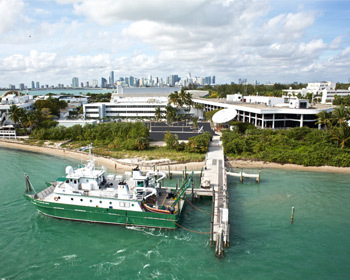 in Maritime Law - Surrounded by water, Miami offers a unique opportunity to study Maritime Law. The city is unquestionably the cruise capital of the world. It hosts the largest single-ship cruise terminal and all the major companies’ principal place of business located minutes from the Port of Miami - the top cargo gateway of the Americas. Honors Early Admission for Prospective Law Students – The Maritime LLM program may offer early acceptance to J.D. candidates with very strong credentials and relevant experience/demonstrated interest. J.D. applicants who indicate an interest may be contacted for entry into the Maritime program’s "Honors/Early Admission Track," and if accepted it would enable completing the J.D. and the LL.M. with only one extra term of study. If interested, be sure to select Maritime joint degree as an area of interest on the J.D. application. The law school draws upon the expertise of RSMAS graduate school by offering a joint degree program in Marine Affairs and the ability to take courses at RSMAS when studying Maritime Law. As one of the leading academic oceanographic and atmospheric research institutions in the world, the School's basic and applied research interests encompass virtually all marine-related sciences. In addition, the faculty includes some of the leading experts on Environmental Law issues with experience working on top level environmental policy initiatives. Professor Bernard Oxman is one of the world's top experts on the laws of the sea and currently sits on the International Tribunal for the Law of the Sea. Professor Richard Williamson teaches introductory and advanced courses in environmental law, courses and seminars on international environmental law. Adjunct Professor Daniel Suman's research focuses on coastal management in Latin America, planning and enforcement in Marine Protected Areas, and public participation in environmental planning. Professor Tony Alfieri leads the law school’s Environmental Justice Project. Visiting Professor Daniel Magraw is an expert in international law and policy, particularly relating to environmental protection. At Miami Law there is also an active Environmental Law Society and Maritime Law Society, and Student Dive Bar Chapter. Other organizations also explore environmental issues. For example, in 2017 the University of Miami Law Review symposium discussed "Climate Wrongs and Human Rights."